Stress is caused by our mind on an overdrive often worrying, anxious and or angry about a real life situation or a perception of fear, emotions and memories. To understand and recognize that stress problem and it damages spring out as symptoms- bad health, anger issues, bad sleep etc is in itself the first step. 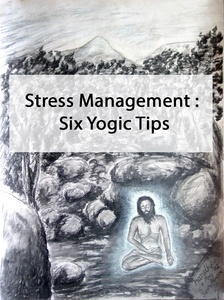 These are the six yogic tips that are offered from the mystic wisdom of the Siddha Sages. Harnessing breath, glide the mind. Understand that breath is the only real belonging we have, while alive. Breath is a key influence behind the mind that produces optimal thoughts. If breath is utilized as a prayer to connect to Source , the outcome is a mind that is pristine in calm and harmony. Slowing down breath enables our mind to slip out of stress. – Inhale from the root chakra (from the perineum) and retain breath. Think of Source/ God/ Void and surrender the mind in its intent and the thoughts of stress. 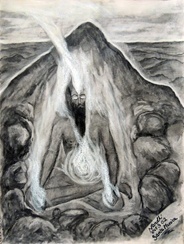 – Retain the breath for as long as we can- allowing all thoughts- good and bad to disappear in the void. – Breath out slowly affirming “I am”. – Follow this cycle of breath for however long possible or even all the time- as this yogi breath awakens our highest wisdom while creating the core space of tranquility, harmony, fearlessness and clarity of the mind. Meditate to attain the Knowing. Our inability to see or know with clarity often times is stress. To attain perfection and genius in what we do- before we begin, meditate to attain a mind of clarity. It is important to ‘Know’ and ‘see’ the bigger picture first- even if in this process we do not have all the information. Meditation often awakens our intuitive abilities to ‘see’ beyond our limited mind. Invoke our Teachers/Masters in our meditation with focus on the third eye seeking guidance of the highest that aligns to our heart. Meditation teaches us the magical Now moment of action and infinite patience. To see the larger picture with a meditative mind is much like visualizing a target so to lock our focus before starting a task, venture or journey. Once started with our task or intent we have visualized strive to attain the ‘flow’. This ‘flow’ means, being inspired in the doings, loving the now moment with mindfulness and allowing ourselves to connect the dots by bringing our focus with passion and will. A meditative mind helps us ‘fly’ over realities. Our action as work and doings from mindfulness helps us ‘glide’. Take a break to celebrate your Source unions- Clap! Stop work for a little minute! Rub both our palms together, feel our reverence to our highest self and as gratefulness to Source/God/Universe. – Clap your hands with our heart song’s rhythm and feel the connective flow of our joy states. – Rejoice and relax in the states of joyfulness while you clap. – Make it a prayer by letting go of our worries and stress to our heart song as we clap. Do yoga as a meditative inner journey of breath, visualization and mantras chant. When we do yoga to journey within and expand our consciousness, we are surrendering our mind, body and breath to Source as prayers. The best time to do yoga is at the start of the day, so our mind is placed at as higher perch. The ‘higher perch’ of the mind refers to a meditative mind that is able to perceive realities with calm and core harmony while able to take decisions that have optimal results. Yoga and meditation- apart from allowing our mind to be stress free also gifts us with a mind that is trained to focus and to hold that focus for a longer period of time. Know breath and the journey through breath while doing yoga. Within every posture and posture sequence is a core harmony- the zero point- where we have surrendered to the process. Let go of the mind and thoughts here to simply be in the vibrancy of calm. Attain and recite mantras or a mantra that your own to ‘cook’ our Inner Fire’. It is said that when we pray we are talking to God and when we meditate, we listen to God. When we chant our mantras, we are doing both- praying and meditating simultaneously. Our stress has a reason that might or might not be caused by actual realities but when we hold a mantra by reciting it, we are intensifying our prayers to Source/God/Infinite to remedy the cause of stress. Awaken the inner fire by way of mantras that we recite. When we recite a mantra, we are changing the inner structure of our mind and its thoughts. Mantras are vibratory fields that have been passed on by Gurus to disciples over thousands of years to transfer consciousness. When chanting the mantras, we are awakening our inner fire that serves as a vortex of Light that protects, guides and assists us. To sleep well and deep is a major battle won on stress. Have a bath/shower, if not, wash our face- especially the forehead. Cut cords of the past as in emotions, tiredness, fatigue with water as energy cleanse. Select from your bedside a spiritual, philosophical or scriptural read. If we do not have a book, simply chant a mantra of our heart and surrender the mind to Source/ God. Turn body onto the left side and read a book of higher vibrations or chant the mantras. . Laying on the left stimulates the breath that induces deeper relaxation to prepare for sleep. As we read/ chant- sleep will kick in soon and it will come to us in different ways. Tell sleep to go away and tell ourselves even if it is till dawn and we do not have to sleep, no worries. Nobody ever died of lack of sleep. In this self hypnosis, we are dissolving the fear of a night without sleep. Continue reading/ chanting. Sleep will come like a tiger growling. Do not worry- continue reading. 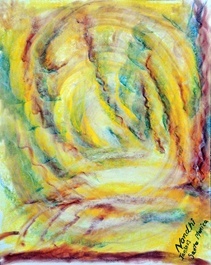 Now when we feel ready to descend into sleep- sit up a moment and recitie a mantra as prayers in focus- setting the intent- that our subconsciousness is Source connected in sleep. Descend into our heart with the mantra chant in the sleep we welcome. Allow all realities to correct and align itself to the vast infinite Universe as we sleep in the womb of Light. Rub our palms together. Acknowledge our left palm as our birth or adopted mother and our rIght palm as our birth/adopted father – and placing palms over our eyelids, receive the blessings of our first Gurus. Rub our palms together and ignite our sacred mantra that we were chanting the night before. Acknowledge our left palm as our Cosmic Mother who will take care of our needs and is protective and our right palm as the Cosmic Father infinity whose dance of bliss form we are in human realities. Receive the blessings. Set intent to be the Yogi and climb above to adorn the eagle mind of consciousness. Be the Sun that shines. Each breath, Source connected! About Nandhiji: Nandhiji is a Siddha yogi, humanitarian & visionary awakening humanity through mystic wisdom, community and service. 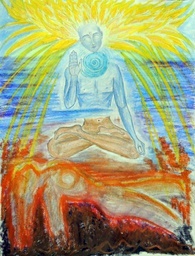 He is an artist, ecstatic chant musician, author and teacher. He represents the path of the Liberated.